In Sedona there once was were merely a few small hotels and lodges. 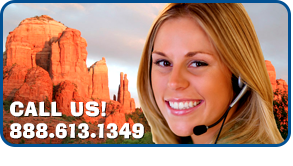 Sedona AZ today offers a wide variety of accommodation catering to the individualized needs of modern travelers. From world-class Resorts to small, family-run Inns, from international Hotel chains to secluded Cabins, from cozy Bed and Breakfasts to budget Motels, the Sedona area has an abundance of lodging options. We invite you to find just the type of accommodation that will make your vacation in beautiful Sedona perfect. Is your family and small children part of your vacation entourage? You might want to opt for one of the many Hotels of the area that explicitly cater to families. Is it just you and your buddies, traveling on a college budget? Take a look at the budget Motels of the area. Are you taking your honey on a romantic trip? Browse the Bed and Breakfasts of the Sedona vicinity which offer quaint lodging with a romantically private feel. Looking for a rustic back-to-nature getaway in the wilds as a contrast to the rat race of the concrete jungle? Check out the Cabins and Chalets tucked away in beautiful Oak Creek Canyon. Are you planning to treat yourself to a week of wellness and relaxation? Be sure to peruse Sedona´s world-class Spas and Resorts to get the pampering you deserve. Are you giving yourself a week or more to discover Sedona´s treasures? You may want to consider renting a Villa, Condo or Cabin instead of a Hotel room and save by cooking your own meals! Will you be in town just a night or two? Why not treat yourself to that Hotel suite special – or enjoy a uniquely private local B&B? Below is a list of lodging categories and descriptions. Help yourself to an overview of the several types of amenities offered in this area. Coming to Sedona, you have already chosen a special spot on the map to visit – now make sure you lodge according to your individual needs. Hotels are family-oriented and usually accommodate four and more guests per room. Hotels set themselves apart from other types of accommodation by typically offering more amenities like a pool, Jacuzzi, fitness center, golf course, and most offer on-site breakfast. Amenities may also include microwaves, refrigerators, coffeemakers, hairdryers and fireplaces. Many hotels are pet-friendly, and in some cases, they have on-site restaurants. Bed and Breakfasts cater to visitors looking for a unique accommodation experience. These are typically family-run guest-houses featuring two or three quaint, sometimes themed rooms, gourmet breakfasts and a personalized service by the keepers themselves. Most B&Bs do not accommodate children; they are orientated toward couples seeking peaceful privacy and lodging with a private feel. 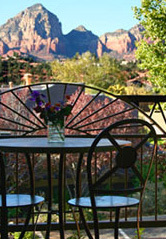 Sedona Inns also feature an intimate atmosphere with personalized service and cozy rooms. These are typically smaller properties that tend to be the boutique hotel category, and their amenities often include in-room whirlpools, breakfast and private fireplaces. Resorts and Spas typically feature upscale amenities for travelers looking to pamper themselves in an environment of elevated service. They offer full spa services, a fitness center, pool and room service, and may also offer on-site specialists like nutritionists, energy workers and yoga teachers. These properties also usually include fine dining and gift shops. Motels typically offer good value lodging for the economy-minded traveler. They often feature limited amenities and smaller rooms and are generally designed for visitors who spend little time in their rooms. These properties include budget motels and hotels that are clean and comfortable and offer some amenities like a pool, refrigerator, microwave and basic continental breakfast. Rooms can accommodate 4 to 6 people, children often stay free. Villas and condominiums offer convenient, “home-away-from-home” vacation accommodation geared towards large families or groups looking at extended stays of one or two weeks. These properties feature one to three bedrooms units, full kitchens and a larger living area, as well as amenities for barbecuing.